procrastinates a trip to the corner ice cream store for a hot fudge sundae; almost everybody procrastinates beginning their income taxes. We postpone beginning something we won’t enjoy doing. But what’s interesting is that we also postpone the creative work we feel we ought to be doing – work we really, really want to do, and maybe aren’t getting paid for until we finish – and instead end up watching yet another rerun of Iron Chef America. 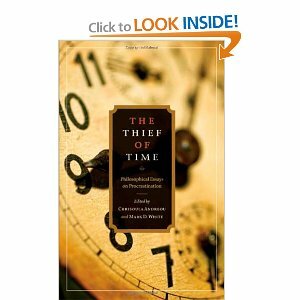 Last month, I was lucky enough to wander into a New Yorker web chat with writer James Surowiecki, in which he discussed his recent article Later, in which he reviewed the book The Thief of Time and discussed procrastination, and all the theories about why we do it. These range rather widely from the old fallback lack of will power to the new theory that we are forever negotiating among our own multiple (and uncooperative) selves. I am really charmed by the idea that inside me are many little egos screaming for satisfaction – perhaps one entirely dedicated to Iron Chef America and trying to figure out what Cat Cora puts in her bread pudding. And lurking behind all of this, some experts suggest, is a fear that we aren’t good enough, that our work isn’t good enough, and that nothing will ever be as perfect as the project we first envisioned, in that golden moment right before we started to procrastinate. Near the end of the chat Mr. Surowiecki brought up the idea that “how people think (construe) a problem has a powerful effect on how they act . . . framing effects can be very influential, and to the degree that you can think of a task as close rather than distant, you’re more likely to actually get it done.” We are all a little delusional about time, whether we are calculating how long it takes to get from here to there or how long it will take to finish a painting, or a film, or a novel. So maybe we can pull back a bit from the idea of that perfect, complete, shining final product, and know that if we begin today, we can watch the twenty episode marathon on TV over Thanksgiving weekend without guilt.